What happened to this card? It was so cool to take stacks of cards and rubber band them together. 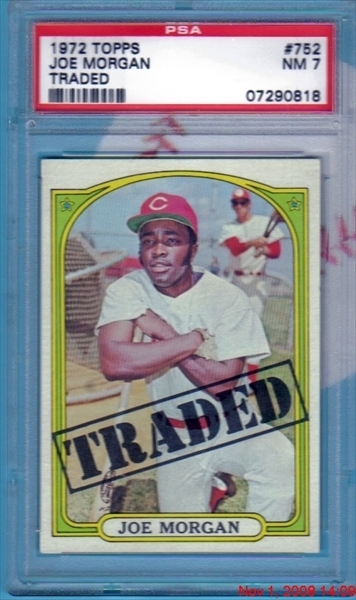 It was the thing to do for many a generation of card collecting kids. Well, we know better today. Keep the rubber bands off the cards!! My friend was cleaning out his basement, when he came across a suitcase full of old cards. By old, I mean mostly from the overproduced period of the late eighties and early nineties. My friend thought he had riches upon riches. It almost broke my heart to tell him that they were nearly worthless. Unfortunately, I do. I know what I'm talking about here. I came to terms, a long time ago, that my heyday of collecting came when the cardboard is usually worth more when recycled. "You don't know what people are willing to pay for something if they really want it bad enough"! That is true, but I can stake my reputation that at least 99% of what I found in the suitcase was priceless. And by priceless, I mean that the value per card would be so low that no price could be affixed to the majority of the cards. I knew I was in for an adventurous night when my friend strolled in with a hardshell powder blue suitcase from the seventies. It even had a mirror embedded into the inside top. It was hideous! I opened the suitcase and gazed upon a cornucopia of beautiful garbage. To be fair, there were some decent cards in there. Anything before 1986, I considered nice. From 1986 until 1994 there was trash upon trash. 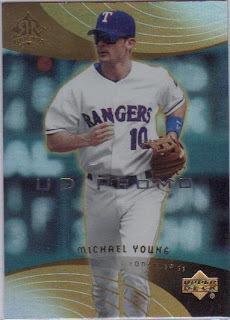 There could have been a few nice cards, except for the fact that they were nicked, bent and scuffed beyond salvage. There were even water damaged cards in the suitcase. Unidentified sticky substances and rubber banded nightmares permeated the case. It was a disaster. 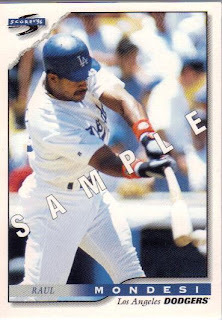 The Mark Grant card featured in the picture above, actually had the rubber band dried and stuck to the cardboard. The rubber band crumbled to the touch, but Mark Grant had two lines of dried rubber that weren't easily coming off. Let this be a lesson, kids. Always take care of your cards! Some time ago, JackPlumstead asked for some help with cards that featured "Sample" and "Promo" across them. I put in my two cents, and for my efforts, he sent me some of the cards!! That is fantastic! Even better? I received them in the mail on my birthday - now, how cool is that!? 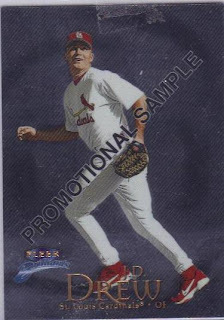 The last card I received comes from the 1999 Fleer Brilliants "Promotional Sample" set. 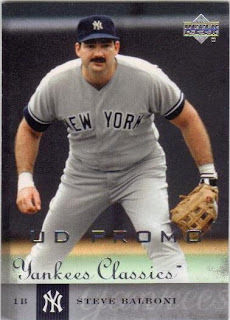 "Set" is a bit of an overstatement, as the JD Drew (Cardinals) card was the ONLY card in the Brilliants promotional set. I have to say, this really is one 'brilliant' card - great foil, nice pic, the back is just as nice (no foil, but the uniform look of the text on back is "noice"!! A big "Thank You" goes out to JackPlumstead from across the pond for these promo cards! 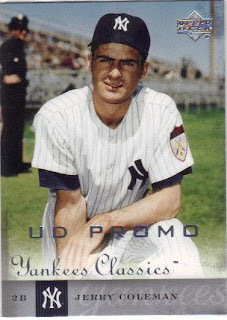 Only after PunkRockPaint left a comment on one of my most recent posts over at Night Owl Cards did I realize that the post would have fit perfectly on Things Done To Cards. But I'm not going to repeat everything that I wrote in the Night Owl Cards post. That would be unoriginal and, for me, repetitious and boring as hell. For those of you who have read the NOC post already and are looking for something new here, I apologize. But I hear that PunkRockPaint is going to whip up something spectacular for TDTC at some point in the future. For those of you who haven't read the NOC post, my first question is: what's wrong with you? Do you want to see a grown man cry? 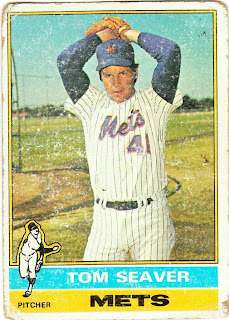 But really, if you want to read about all of the things that I did to this 1976 Tom Seaver card during one year of my childhood, as well as some of the things I did not do, then click here. Feel free to share what you did to one, single card when you were a kid. Either here or over at NOC. I may be stretching the definition of cards here, but with all the celebrity deaths today, I think it's appropriate to widen the definition. When movies are released into theaters, they typically are accompanied by posters and billboards and all sorts of advertising. The advertising that most of us don't see is the lobby card. They are typically 11 inches by 14 inches, but have known to be 8 inches by 10 inches. I couldn't tell you the last time I actually saw a lobby card on display, but they still make them. One of the lobby cards that I'd like to show today is for the David Cronenberg film, Rabid, from 1977. Yes, it features the now late Marilyn Chambers in one of her few mainstream roles. Anyone who has been to my house has been amazed at my wall of movies. I am a movie buff, but some things still elude me. I haven't seen Rabid since I was a teenager. I couldn't really recall what it was about, but I remember a motorcyclist and rabies. It's not a movie to show the kiddies. The lobby card made me instantly remember to motorcyclist. A quick search on IMDB confirms the part about a strain of rabies. Most lobby cards feature a scene from the movie or a publicity shot from on the set. Usually they are black and white, but some have had color over the years. I always found the lobby cards very interesting. It was always something extra to take from a favorite movie. Especially, the ones that featured a candid shot of the actors still technically in character. You can pick up lobby cards fairly cheap. I like the ones of oddball movies the most. They usually feature the candid photos or the deleted scenes. I'm going to have to track down Rabid, now that my hazy teenage memories of the film have resurfaced. Every November, the Greater Boston Sports Collectors Club hosts a big show in the Shriners Auditorium outside Wilmington, MA. Packed with dealers and goods, it's the best Boston show of the year and second only to the National on my personal calendar. You can find a lot of vintage cards, promotors arrange a bunch of signature guests, and plenty of real, live Shriners work security, fezzes at the ready. There's only one downside to living near a good show: your wantlists shrinks year after year, constantly cutting the opportunity to make a good deal. Fortunately, they don't all go away. Just last year I snagged a battery of baseball luminaries from one seller. 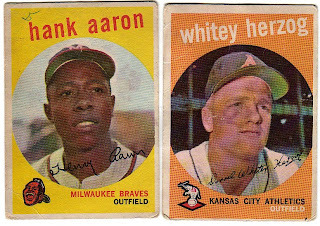 Two 1959 Topps, #380 Hank Aaron and #392 Whitey Herzog, cost a grand total of $8. One cannot easily turn aside such quality cardboard and I snapped them up. 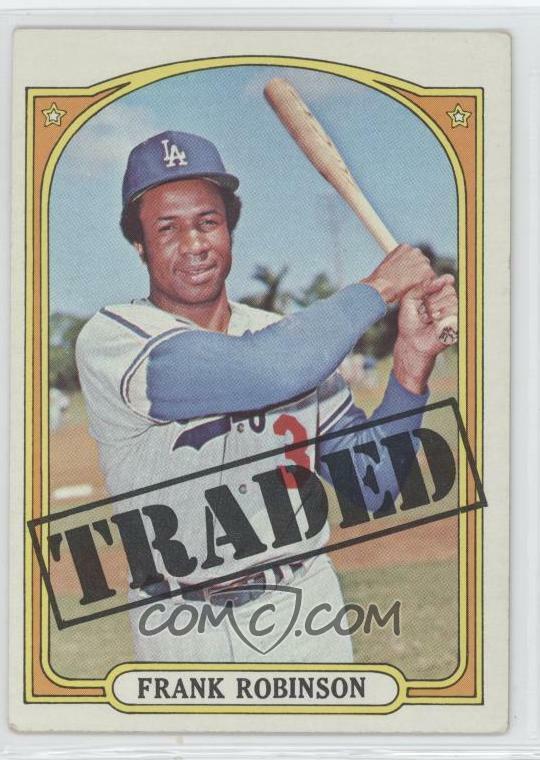 Some good deals come with a "catch" in the transaction and this one proved no exception. See the Gorbachev-like mottling on Herzog's face? Like chained fugitives on the run, Hank and Whitey were actually a single unit, bonded back-to-back with 50 year-old gunk. 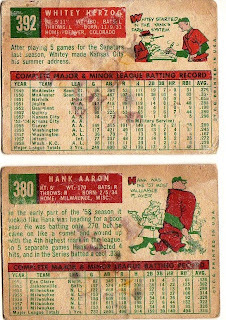 Based on the card numbers, perhaps an avid collector affixed his whole set to paper in numerical order, putting #380 and 392 on opposite sides of the same page. There's no stopping dogged persistence. Bonded cards like these two represent a real risk, since scrapbookers of the past secured their treasures with all sorts of nasty adhesives. I bought them with the intent of separation, but it's important to draw the line somewhere when dealing with glues-that-time-forgot. It might be water-soluble paste, rancid rubber cement, or just liquid evil. You hope it's the first one, since the worst only dissolve under the toxic influence of toluene, a substance best avoided. I've used acetone (nail polish remover) on stubborn cards in the past, but always don a mask around the fumes. For Whitey and Hank, I started optimistically with water, and so should you. Grab a shallow bowl, fill it an inch or two deep, and drop in your victims. They'll float on top, so push them underwater like a younger sibling at the pool. Hold them down for a minute (the cards, not the sibling) to soak completely. A paperweight works great here. Ultimately, you want the sticky stuff to loosen or dissolve without force, so I left these two in the water overnight. Pass the time by contemplating your navel, eating some ice cream, or blog about spilling ice cream in your navel. 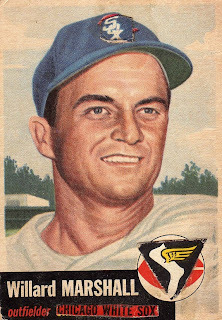 The card darkens during the soak and it is possible to stain or fade if you leave it in too long. Better to go one night at a time. If the glue's not loose after two nights, water's not the answer. You'll need to try something more aggressive (and risk card damage), switch to a chemical, or write off the project as a learning experience. In my case, an overnight bath did the trick. With most of Hank and Whitey already floating free, I coaxed the pair carefully apart and transferred them to paper towels. A viscous, yellowy old paste covered both backs. Being already wet and crumbly, gentle picking with a fingernail cleaned off the schmutz. (It took about five minutes for each.) Work slowly if trying this at home; get the glue off, but leave the card back intact. Worst case scenario: nasty glues can bond directly with the card, making removal practically impossible. In that event, practice swearing in a foreign language. End result: legible backs! After cleaning, I sandwiched the cards in new paper towels, pressed them between heavy books, and did some more waiting. A couple of days of drying brought them in line with the rest of my collection. Note: Holding the cards between solid objects keeps them from warping as the water evaporates. If you don't care about that, just put them on the counter in the open air. Some people hot iron their cards back to health, but must be careful not to burn or blanch them in the process. Free free to post feedback or success stories in the comments. Note that this article assumes you're soaking cards for the sake of separating them. Some collectors consider this alteration, especially if you're trying to mask problems with an otherwise high-grade card. See this Network54 guide for more info and use your best judgment!